Time for another Bargains of The Week and a chance to see what I've been purchasing recently. It does seem to be all about the clothes these days but I think that's because I'm trying to stock up and plan ahead so Harlow actually has something to wear when she gets bigger. Anyway, on to the bargains. I nipped into Sainsbury's when they had their 25% off clothing sale and noticed they had a seperate half price sale rack as well. When I went to the till I was pleasantly surprised to note that even the half price clothing was allowed an additional 25% off. As you can imagine I had a big smile on my face that day. 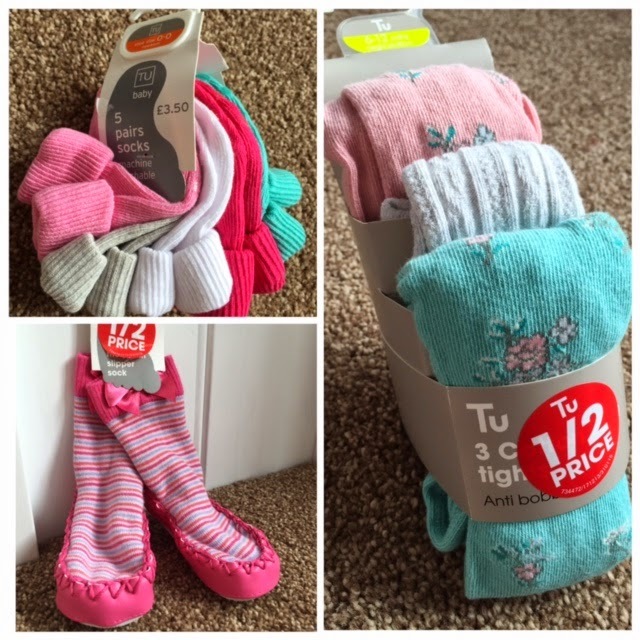 I managed to buy 5 pairs of socks in size newborn which were originally £3.50 down to £1.75 half price then with the 25% off it made them £1.31! What a steal. I then spotted these super cute 3 pairs of tights in size 6-12 months, originally retailing for £6 down to £3 half price then with 25% off which made them £2.25! Another steal. Last but not least I couldn't resist the moccasin slipper socks (size 6-9 months) which were £5 down to £2.50 half price then reduced again to £1.87 with the 25% off. All this cuteness for only £5.43. Happy days! As always I like to have a look at the book display stand in Sainsbury's and they had 2 lovely books on offer which I couldn't resist. 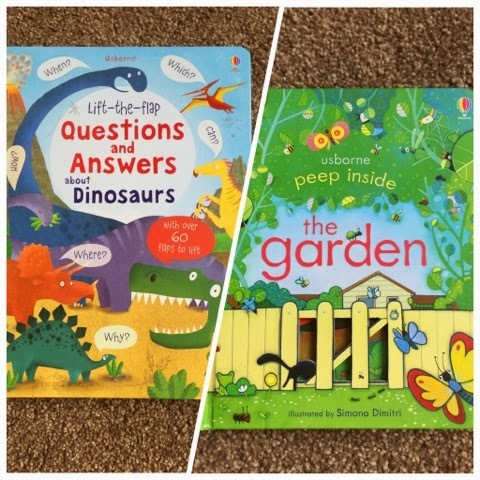 I bought the Usborne Peep Inside The Garden book for Harlow for when she's a little bigger and the Usborne Lift-the-flap Questions and Answers about Dinosaurs book for Logan which he loves by the way. The garden book is £3.49 (£5.24 on Amazon) and the dinosaur book is £4.99 (£9.99 on Amazon). Superheroes in our house are much loved in any shape or form so when I spotted this Teenage Mutant Ninja Turtles top in Sainsbury's down to £4 from £8 I just couldn't resist for Logan. 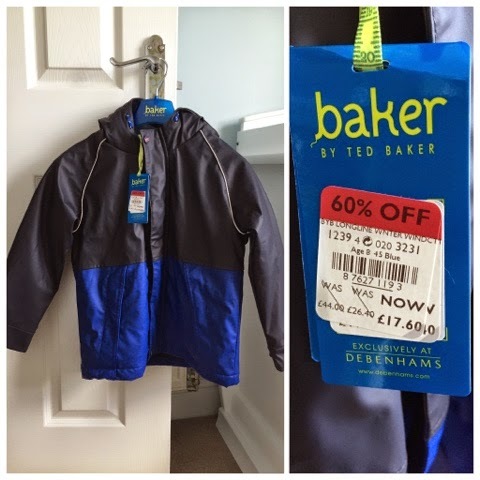 It's a size 7 which he should grow into around August so perfect for starting off his next wardrobe. 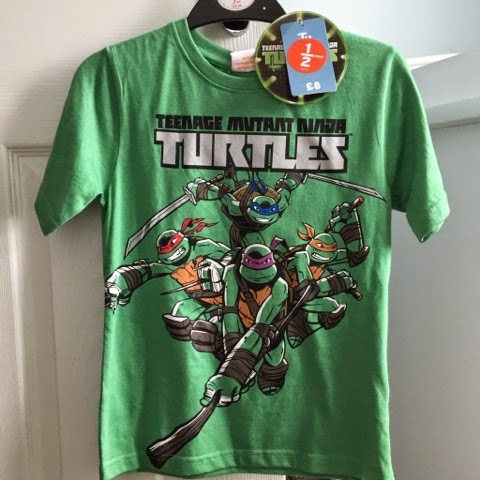 I had to return some tops to Debenhams the other day that I had bought for myself. They weren't any good and not very breastfeeding friendly which was a shame but whilst I was mooching around having a look at the sale section I spotted this lovely coat for Logan for when he's older. It's a nice Ted Baker number and perfect for the cold wet weather we have in Scotland. As you can see it was up at £40 odd pound but with 60% off it was reduced to £17.60! 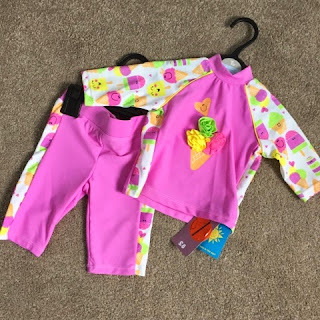 Since we've recently booked up a little holiday in the sun I thought I'd need to make an effort and look for some swimwear for baby girl. Something that would keep her skin safe and protected whilst paddling in the baby pool. As my luck would have it this baby was reduced in my local Sainsbury's store. Size 6-9 months it was £8 reduced to £2.80. What a bargain. As always please do share any bargains you've come across recently. I love to see what types of bargains people have got their hands on. 4 comments on "Bargains of The Week - w/c 27.04.15"
We love Usborne books in our house too Ashleigh. I see Amazon have the New Baby book for £3.99 at the moment? The Garden book is fab isn't it Jenny. My son loves looking at it even though I was keeping it for Harlow. She'll get it eventually lol.